If you have a dog, you likely know the struggle that comes with trying to keep your home and furniture dog hair free. You love your furry friend, and you don't want to banish them to the floor, and this is where the best cordless vacuum for pet hair comes in. There are dozens of these cordless vacuums available, and this can make it difficult to pick out one that can keep your home clean. We've rounded up the top five vacuums so you'll have a good pool to choose from, and our buyer's guide will give you criteria to keep in mind when you're shopping. In the United States, roughly every three in 10 people have allergies to pet hair and pet dander, and this is why having a good vacuum is so important. Pet hair sticks to everything, and you need a powerful vacuum to pull as much of it out of your carpeting, drapes, and upholstery as possible. Some of these areas may be difficult to reach with a traditional corded vacuum and having a cordless vacuum ensures that you can reach any area you need to quickly and easily. There are several things you want to watch for when you're shopping, and there are two basic types of cordless vacuums to choose from. Before you decide on which features you want your vacuum to have, you have to determine what type is going to work best for your situation. You can also get a vacuum that functions as both an upright and a handheld cordless vacuum, but you'll pay more for it. Handheld cordless vacuums are obviously smaller and lighter, and they're better suited for working on smaller areas. 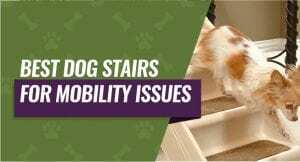 They do very well picking up pet hair on furniture and stairs, and they're compact, so they're easy to carry around with you from room to room. Upright cordless vacuums are better suited for sucking pet hair out of larger areas in your home like a living room or a larger family room. They're bulkier and slightly more difficult to handle, but you can get attachments to help you clean your upholstery and stairs. When you've picked out the type of vacuum that's going to do the best job for your situation, you can move on to the important considerations you want to keep in mind when you're looking at cordless vacuums. Your vacuum most likely won't have all of these features, but you can find one that has most of them. A lot of cordless vacuums come with optional attachments that can help you reach into all of the little nooks and crannies around your home. A hose attachment with a brush head can make it very easy to vacuum your stairs or your furniture. Other useful attachments include a narrow suction head that will help you get into corners or between appliances, upholstery or drapery head and additional hose attachments that help you reach higher areas of your home. Since this vacuum isn't plugged into a power source and it runs on battery power, you want to make sure that your vacuum gets enough run time out of a single charge so that you can complete your vacuuming. Unfortunately, it takes a larger battery to get a longer run time, and this adds bulk and weight to your vacuum. Most stick-style vacuums give you between 20 and 30 minutes of run time on a single charge, and this includes running a motor powered brush roll and having a good suction. You may want to look into models that come with two batteries so you have a backup you can swap out when the first one dies. Certain dog breeds have a rough layer of their fur, and this rough layer can wind around your carpet fibers and make it very hard to get out. If the vacuum's motor powers your vacuum's brush roll, it will work with the suction power to loosen and remove the stuck in pet hair. Also, if it has motor power, it'll continuously agitate as long as the vacuum is on. This helps to loosen up any stuck in pet hair, and it doesn't require you to do anything but turn the vacuum on and run it over your carpet. We mentioned that most cordless vacuums give you between 20 and 30 minutes of run time on a single charge, but how long does it take your vacuum's battery to charge? The last thing you want to do is get stuck when you're halfway done vacuuming because you ran out of battery. Along with how long it takes your battery to charge, look for a quick charge feature. This can shorten your downtime, and it's great to have if you don't have a backup battery on hand when your vacuum's battery dies. Your vacuum's docking station usually attaches to the wall, and this is how you charge and store your vacuum when you're not using it. A lot of these docking stations are compact, and you don't want something that sticks out from your wall. Your docking station should be easy to assemble and put up, and it should also be easy to secure your vacuum to it when you want to charge it. This docking station should also be easy to remove from your wall if you're going to change the location as well. An effective way to remove allergens and pet dander from your home when you vacuum is to buy a cordless vacuum with a good filtration system. In particular, HEPA filters can remove 99.97 percent of contaminants in the air, and this includes other contaminants up to 0.3 microns. This filtration system can also pick up and filter out pet dander, and this can reduce the number of dust mites in your home because they feed on any leftover pet dander. These particles get stuck in the filters, and you can remove them from your home to increase your indoor air quality. One of the biggest draws of buying a cordless vacuum is that they're usually more lightweight than corded models. This lightweight design makes them easier to maneuver and carry around your home. You do want to check that the battery won't add a lot of extra weight, but you do want a more powerful battery so double check the weight. Also, check the attachment weight and how easy it is to carry upstairs. Your vacuum has to have powerful suction to be able to pick up your pet's hair, and a cordless vacuum can be more limited than a corded one because it doesn't have as much power. You want a vacuum that has a higher battery voltage because this will determine how powerful the suction is. The top cordless vacuums typically have batteries with voltages ranging from 20 to 25 volts, and the closer you get to 25 volts, the more suction power your vacuum will have. If your vacuum doesn't have enough suction, you can miss a lot of pet hair no matter how many times you vacuum. This cordless vacuum comes with three different options to choose from including a regular vacuum, an anti-allergen model, and a pet model. This stick vacuum is a great option that can clean from the floor to the ceiling quickly and easily with a grab and go removable canister. It has a built-in dust canister that picks up and compacts any debris so you can vacuum longer between cleaning the canister. It also has built-in Smart Sense, and this allows the vacuum to switch suction to match bare floors or carpets automatically. The technology also monitors the battery level and the filter, and it'll automatically tell you when it's time to change or clean the filters and charge the battery. The rubber bristles are anti-tangle, and they're designed to get pet hair that may be trapped deep into your carpets. People who purchased this vacuum liked the fact that it comes with up to an hour of vacuuming time on a single charge as well as the fact that it comes with a three in one accessory tool that makes cleaning easy and fast. They didn't like that the vacuum doesn't have the most powerful suction. This cordless vacuum comes in two different choices including a model with an extra battery. 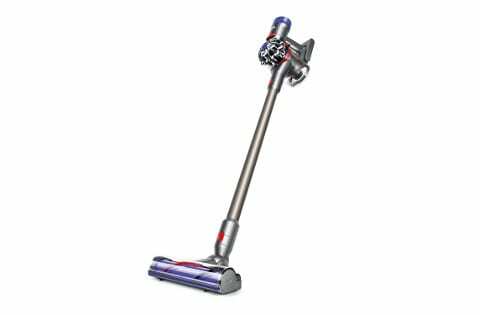 It uses wind tunnel technology that creates a powerful channel that helps the vacuum lift embedded pet hair, dirt, and debris. You get an extreme recline handle that lets you quickly and easily get under your furniture without having to move it around. It also has edge cleaning bristles that scrub the carpets to get stuck-in debris as well as bristles that reach right to the walls and edges to get any caught pet hair. This vacuum allows for multi-floor cleaning, and it's easy to switch between hard flooring to carpets as you vacuum. There is a fuel gauge that alerts you when the battery is low, and it helps you keep track of how much time is remaining before you charge it. People who bought this vacuum liked that it had edge bristles to allow them to get tight to the walls. They didn't like that they had problems with the warranty or that the charger didn't last over a year. This slim vacuum features a very light and durable design that's easy to manipulate and use around your house. It has multi-flex technology that lets you reach under furniture, appliances, and in corners easily. You'll get DuoClean technology, and this technology features two different brushes that reach deep into carpets and polishes hard flooring at the same time. You can purchase a second battery so you can upgrade your system and run your vacuum for twice as long without having to wait. This vacuum converts to a handheld vacuum quickly and efficiently so you can vacuum the stairs or drapery or you can pick it up and take it with you. It comes with several accessories including a pet hair attachment, upholstery tool, duster crevice tool, and more. People liked that this vacuum could convert from a stick vacuum to a handheld unit quickly and easily. They didn't like that the vacuum only comes with one battery and that you have to purchase a second battery if you want to upgrade it. 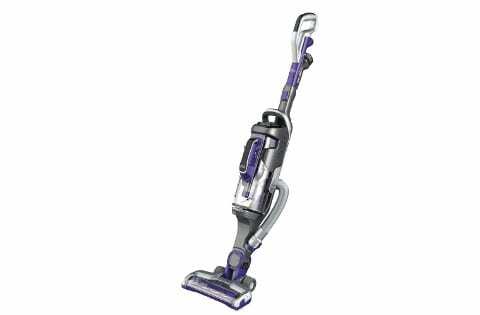 When you use this vacuum without the motorized tools, you can get up to 40 minutes of run time on a single charge. This vacuum has a versatile and lightweight design that conserves the battery and doesn't use it until you hit the instant release trigger. The bristles are made out of a stiff nylon material, and they're designed to get deep down into your carpet fibers and remove stuck in pet hair. The entire vacuum has a HEPA filtration system that works to trap and hold dust, allergens, and pet hair, so you get a cleaner indoor air level. You get a powerful V8 motor that works with the battery to create powerful suction and clean deep down in your carpet fibers. There is also a slightly larger collection bin that reduces the number of times you have to empty it. People who bought this vacuum liked that it has stiff nylon bristles that drive down into their carpets for a deep clean. They didn't like that the charging port is located right where your hand naturally sits. 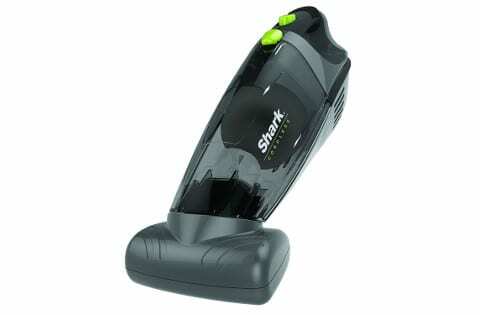 This small and compact handheld vacuum comes with a lithium-ion battery. It also has Twister suction technology that gets deep into carpets to remove stuck in pet hair and ground in debris. You'll get a detachable motorized pet brush that quickly removes debris from stairs, carpets, drapery, upholstery, and car interiors. It also has a crevice tool that makes it easy to get into hard to reach places and corners for an all over clean. This vacuum has a larger collection canister that effectively traps dander, dirt, and debris, and it allows you to go longer times between emptying it. This vacuum is very lightweight and easy to take up the stairs or from room to room. People who bought this vacuum really liked that it features a very compact design with Twister suction technology. They didn't like that this vacuum's battery doesn't last through extended use without having to be recharged. 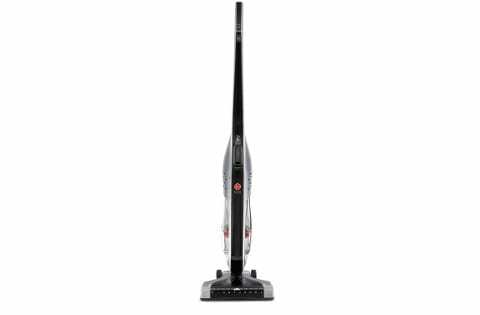 Our choice for the best cordless vacuum for pet hair is the BLACK+DECKER POWERSERIES PRO Cordless Lithium 2 in 1 Pet Stick Vacuum. It comes in three different model choices, and this vacuum has several built-in technology options that make it a powerful tool to help clean up pet hair. It has stiffer rubber bristles that are anti-tangle and they get deeper into your carpeting to remove ground-in pet hair. All of these reasons make this vacuum our top choice for pet hair cleaning vacuums.